To access a mini documentary of sub characters (top ten), wait for the menu to load at least twice (let the main menu run a couple of times, undisturbed), then it will let you access the red orb on the upper right. On the first disc, go into Setup first. You don't have to change anything. You can just go in and exit back out to the Main menu. Press right from Play. This will cause the signal lamp that is unobscured to light up. Press enter and you get a live-action segment titled "Japones Headline" with Megumi Hayashibara. On the first disk, just go to "title #12", and you will get a creditless opening & ending. On the first disk, either let the menu to run at least twice or go into Setup and exit to Main Menu. This allows you to select the red orb on the upper right corner. 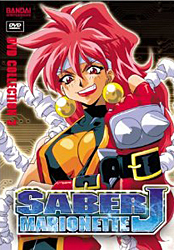 From there, press up on your remote, then down to hightlight J on Saber Marionette J logo. Either press down again or press Enter to view creditless opening and closing.